The dumplings need to steam in the pot so they cook and become nice and fluffy, so cover the pot with a lid and don't peak for the next 15 or 20 minutes. Leave them alone, go do your nails or drink a coffee, or tea in my case. When the time's up you're done. You have a nice thick broth loaded with chicken and dumplings. Comfort food at its finest, my friends. This easy recipe for chicken and dumplings screams comfort food. 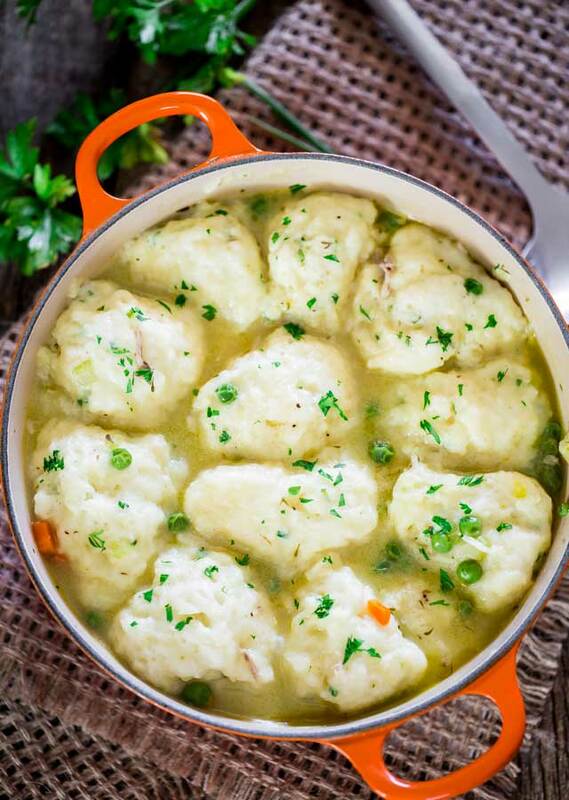 A hearty recipe using roasted chicken and fluffy buttermilk and chives dumplings that's simple to make and the whole family will love. In a large Dutch oven add the olive oil and heat over medium-high heat. Add the chopped onion, carrot and celery to the pot and cook for about 5 to 7 minutes until the onion sweats and becomes translucent. Add thyme to the pot and the 4 cups of chicken broth. In a small bowl whisk the flour with a ladle of the broth from the pot then pour back into the pot and whisk making sure there are no lumps. Stir in the frozen peas and the shredded chicken. Season with salt and pepper and cook for 5 minutes. While the broth is cooking, prepare the dumplings. In a bowl whisk together all the dumpling ingredients, making sure not to overmix, if you overmix the dumplings will turn out too dense. Drop dumpling batter using a spoon into the thick broth. Make sure you don't take too much batter at once because the dumplings will double in size while they cook, so make them as big as you wish. Cover the pot and simmer for about 15 to 20 minutes or until the dumplings are cooked. Make sure you don't peek while the dumplings are cooking, because they need to steam in order for them to cook and be nice and fluffy, lifting the lid will release the steam. After about 15 minutes use a toothpick to test if the dumplings are cooked through. 0 Response to "Chicken and Dumplings"